The Visual Project Explorer (VIPER) is a unique open science application that provides overviews of research projects indexed by OpenAIRE. It enables funders, institutions and researchers to systematically explore a project’s output, and to understand its impact in different areas. 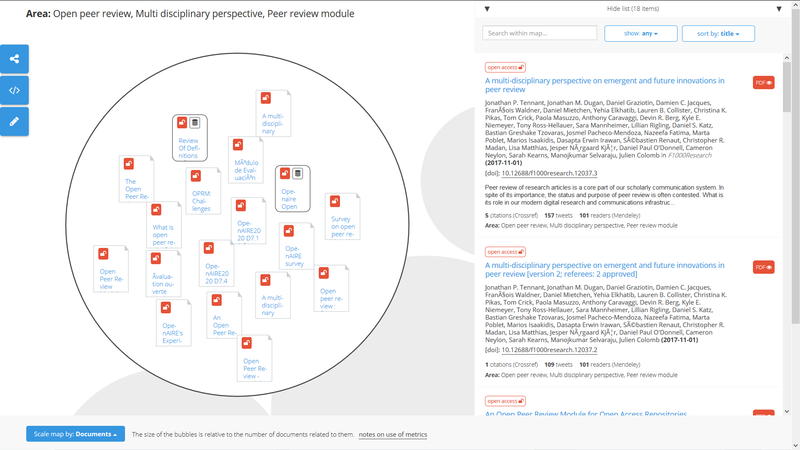 In VIPER, each project is represented by an interactive knowledge map: a visualization showing a topical clustering of a project’s publications and datasets, complemented by a list view of these outputs (see image above). Users can interact with the visualization by zooming into a particular cluster and inspect the underlying outputs in detail (see image below). 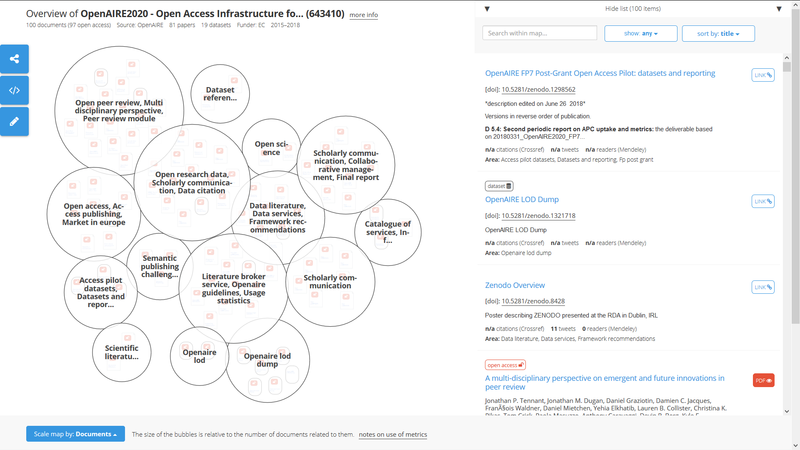 Users are even be able to view open access publications within the same interface. Clusters and outputs are scaled according to different metrics, including open citation data and altmetrics. Therefore, VIPER will help projects keep track of the reception of their project in a multifaceted and contextualized way that goes beyond simple aggregate numbers and rankings. VIPER is based on the OpenAIRE database. We use the OpenAIRE API to retrieve publications and datasets related to a project and visualize them with our award-winning open source mapping software Head Start. The resulting maps are automatically updated by a processing component that queries the OpenAIRE API at regular intervals. VIPER exploits a unique property of OpenAIRE data: the link between projects and publications and datasets. This, in turn, enables us to realize this innovative open science application.